I’ve decided to dust off my old attempt at a blog because of some calls & emails that have come in recently- Since we work out of the studio now, we don’t have as much direct customer contact as we used to with the gallery (that may change soon!). We have shows that we regularly attend & so many faces that we love to see- but, we miss that daily direct face to face contact that can only happen in person. So to prevent all of the minor chaos theory that is any small company from slipping through the cracks, I’ll be posting interesting links & pictures, mini-website reviews, useful directories, musings on this piece or that- not necessarily here at Amberjewelry.com, but wherever the web may take us. Recently I’ve spoken with someone purchasing a gift because her daughter’s entire jewelry collection was stolen in a burglary & she found a piece with us to help her daughter start over again- "Emma". This was wedding jewelry, family jewelry. I was so incredibly touched that this person found the right piece to do that with here. I rushed a package to someone so that a family member who is very ill could see them wearing a special gift. I learned from someone that there are dogs that have "bad hair days" & they’re called "Labradoodles!" I took a call from someone who I could barely hear because he was stuffed inside his closet trying to muffle the sound of making an order so his wife would not hear him placing his Christmas order 🙂 I confess, at one point, I had to giggle too. I’m not sure how this blog will work- I know we discontinued our previous guestbook- which literally had hundreds of entries in it last year because it seemed to attract persistent pop-ups. But we find we miss the little sparks & connections. Personally, I use a version of Lavasoft’s Ad-Aware to help keep my computer free of malicious ad & spyware. That, plus a good anti-virus program. So… welcome to Andzia’s Amber blog. I do not have any idea of how often I’ll be able to update it- I do know that I will keep an eye on it & monitor it for profanity & troll postings- which will be deleted immediately. I may have to enable email approval for comments, but we’ll just have to see. The images & galleries will probably have to wait until after the holidays for a serious update, but we have some glorious items in transit even as I write this, so we’ll see. Questions? Stories? Feel free to share. This is a moving picture, a little snapshot of what goes on behind the scenes. Don’t worry, I won’t share anything that isn’t generic. 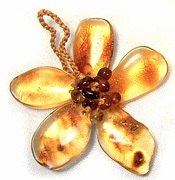 I did also, this week, have the very amber blossom I thought was so unbelievably gorgeous I chose it for my business card returned- which was okay, in a way, because it is probably not something I should have parted with & so it is now in my personal collection. If you have specific questions about items or orders for which you need a speedy answer, please use the contact form at Amberjewelry.com. Andzia will be starting a semi-regular column called "Ask Andzia," as time allows so if you have questions please submit them here or via email, & we will try to track down answers for you.